eLearning is an ever growing industry and various companies are beginning to take advantage of the accessible technology. Employee training is timely and there are thousands of requirements within each industry, making elearning an effective option for all. With over 13 million employees working in either retail or restaurants, customer service accounts for a vast majority of online learning. From new hire onboarding to operational training to compliance, most customer service organizations need valuable learning for each type of employee. The average turnover rate is 60% across all industries, so training new hires can be daunting and timely. Thankfully, elearning can be done at a self-paced rate, adjusting to most learning styles. In order to compete in the customer service world, employers must keep their employees up-to-date with the latest training and requirements. The biggest training requirements for customer service can easily be taught through online learning. Examples of these requirements include, operational training, product training, soft skills and software training. Developing and maintaining soft skills can get you far, especially in the customer service world. Training employees how to properly answer phones, address customers, write emails and handle dissatisfied customers must happen at the beginning of their job. eLearning allows managers to purchase a wide range of soft skill courses to give their employees the tools to further learn the customer service world. Upper-management needs to be aware of what’s happening within their company such as product organization, customer satisfaction, and return policies. The manager on duty either in a restaurant or retail store needs to be sufficiently trained in these aspects and should understand how to handle anything that may happen within the company. eLearning allows for realistic simulations that show learners what can happen in their service careers. This gives them the opportunity to practice handling the situation before it occurs in real life. 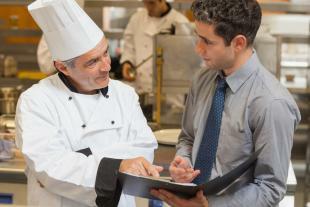 OpenSesame has a range of courses touching on subjects from store safety to proper restaurant and food service management. Store operations are crucial to customer service success and if your employees aren’t properly trained, they can bring down your overall customer satisfaction. This should go without saying, but employees will always need to know the product. Creating personalized courses for your company about individual products can further aid new hire training and current employee training. Employees directly address customer questions and concerns, therefore product knowledge needs to be a high priority. The retail and food and beverage industries generate new fads and products almost daily, requiring organizations to stay on top of the trends in order to compete with others. eLearning allows for no misinterpretation of the products as companies can update their courses whenever needed. Understanding basic billing, inventory management, opening and closing a till, etc. keeps restaurants and retails stores functional. Each employee should understand the software that is used within the company and online courses can walk them through how to properly complete each task. Software compliance is one of the most important aspects of customer service, aside from product knowledge of course. Overall, proper training in customer service should be taken seriously and elearning can make the process simple and effective for everyone.